Have you ever purchased a blueberry waffle, blueberry muffin mix, or any commercially produced product which is blueberry flavored? If you've done so, there's a very high chance that the product you've consumed contains no blueberries whatsoever. Most "blueberry" is candies that are flavored to taste like the real thing, but actually have little to do with it. That's because real blueberries are expensive, not particularly sweet, and troublesome to handle in their fresh state (as they will mold or go bad rapidly). Most people don't realize when they're being sold something as something it's not. Even when they learn the truth, if they're satisfied with the taste, they generally don't care. I think the same might be said for the often faked flavor of wasabi. I've read that most wasabi in the United States is colored horseradish. I have no idea if it is fundamentally different in taste, but I'm guessing it may be different in terms of the overall flavor depth and the experience of eating wasabi. I've said before that wasabi is different from other spicy flavors (that's spicy in terms of being "hot") in that it burns the back of your nasal passages. Intense wasabi will punch you, literally, in the back of your nose. These rice crackers can be a full freaking assault to your entire nasal system. I found that the intensity varies, but if you get a particularly potent one, it will flood your nasal passages from back to front in a flash of painful intensity and hit the back of your throat for good measure. By random chance, if you get one of the less intense ones, it'll just offer a strong, but relatively closer to average hit toward the back. The nuggets offer a bit more than just the pain that can accompany wasabi. They smell vaguely of soy sauce and have a nice savory undertone that lingers on the middle of your tongue quite awhile after you've recovered from the wasabi attack. The saltiness and overall savory nature is undercut by the presence of sugar. If you've ever made soup and added a little sugar to it (the Japanese often do), you'll note that it'll mellow out any too sharp flavors. Incidentally, sugar is the third ingredient in these after glutinous rice and soy sauce (and before "wasabi powder"). If you're watching your sugar intake, these may not be the best choice. The texture of these is hard and crunchy. "Arare" sembei is denser, less airy and spongey, and crispier than what is often called "soft" or "fluffy" sembei. I think these are designed to be enjoyed mainly with drinks, particularly alcohol, but anyone who likes wasabi can dive in without potential inebriation to off-set the nasal beating. I only paid $1.50 for these at Daiso Japan, and I'm torn about whether I'd get them again. 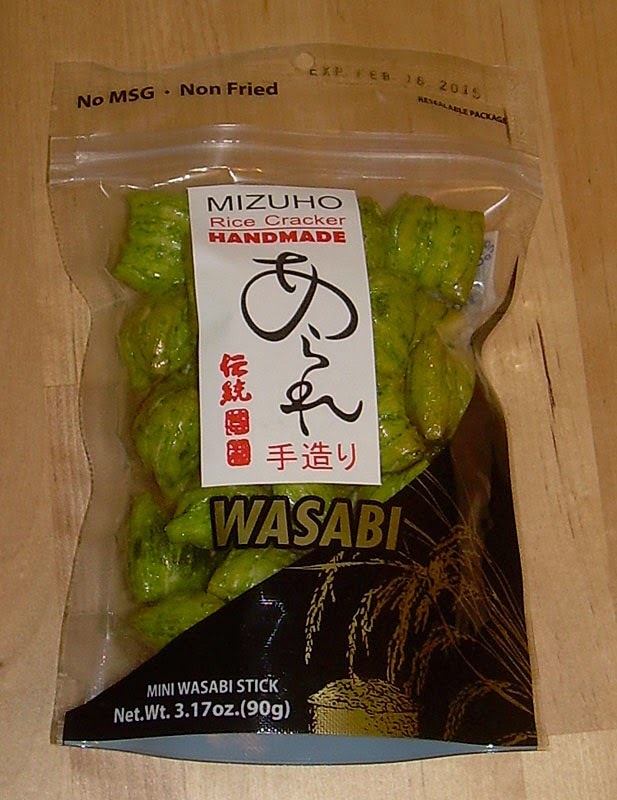 I like them quite a lot in terms of the taste and they are made with real wasabi. However, when I hit a powerful piece, it truly is a bombastic experience in my nasal cavities. It reminds me a bit of snorting soda through my nose and not in any way pleasant. I'm not sure if the price I may pay in pain is worth the experience, but I'd probably go for another round of these in the future after I had forgotten that some nuggets are more pain than pleasure.